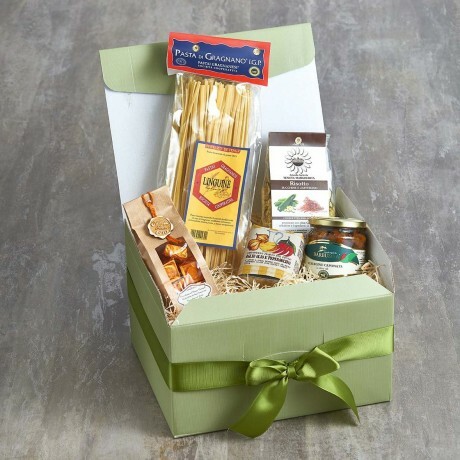 Your vegetarian friends, relatives and colleagues will love this gift box of delicious Italian goodies. They will be able to cook up a tasty (and very easy) veggie meal with these lovely gourmet ingredients from some of our favourite Italian producers. Sicilian Aubergine Caponata (314ml) Your vegetarian friends, relatives and colleagues will love this gift box of delicious Italian goodies. They will be able to cook up a tasty (and very easy) veggie meal with these lovely gourmet ingredients from some of our favourite Italian producers. Garlic and Chilli Pepper Oil (175ml) Your classic oil for ‘Aglio, olio, peperoncino’ spaghetti – the simplest, quickest and tastiest spaghetti dish you will ever find! Just cook your spaghetti until al dente, heat a little of this fabulous oil in a frying pan, add the cooked spaghetti to the oil, mix together well and serve! Great too for making tasty salad dressings or as a dipping sauce. Bronze Die Cut Gragnano Linguine Pasta (500g) Bronze die cut, dried at low temperatures and made in Gragnano the birthplace of dry pasta, our Pasta Gragnanese linguine not only taste better and retain all of their goodness when cooked, they also have plenty of surface area to absorb the flavour and liquid of the sauce with which it is served. The name Linguine refers to the flattened shape similar to a little tongue (lingua). We recommend cooking linguine with fresh tomato, vegetable and spicy sauces, porcini mushrooms or fish, shellfish and cheese sauces. Also delicious with saffron, radish and ginger. Courgette & Saffron Risotto Mix (250g) Our risotto mixes are prepared by our partner Tenuta Margherita based in Vercelli, Northern Italy. Only their own superfine Carnaroli rice is used in our mixes which are made to a traditional family recipe. Easy to prepare with all natural ingredients, this tasty courgette & saffron risotto makes for a quick and gourmet main or side dish. Just add a drop of olive oil or butter, a little dry white wine and hot water and cook for around 18 minutes. Serve with a sprinkling of grated parmesan. Creme Caramel Chocolates (100g) Individually wrapped, luxurious Grand Cru dark chocolates (min 75% cocoa) from the Dominican Republic filled with sweet creme caramel! All products are carefully wrapped and presented in a lovely gift box which is hand-tied with a pretty ribbon. A gift message option is available at the checkout. Please note that if we are out of stock of any item we reserve the right to substitute it with the most similar available item. Allergens: wheat, celery, saffron, milk, whey, soybeans, sulphites, sesame, eggs, gluten.